The powerfully rank organ of a weed spawned by the humid tropical climes of Africa and Oceana, an oversized bulbous growth, the white flower on the principal's/school director's desk held my attention as the director and my mother spoke. The flower looms in my memory with a size quite disproportionate with its caliper measure, just as the white moon at the horizon looms with a with a presence whose enormity is completely at odds with the piddling measure captured by those calipers. Outside, just a moment ago, my eyes had adjusted themselves to the blindingly white light bouncing off the sidewalk (or at least this is how I remember it) framing the buildings of the Paradise Valley Day School, which institution I was about to enter as a kindergartner. The heat outside was oven-dry. Inside was a moment of coolness, concentrated in the calm, luscious white of the flower. Its petals would have been coolly soft had I pressed them to my forehead. Their white would have been informed by the near-translucency of the petals. 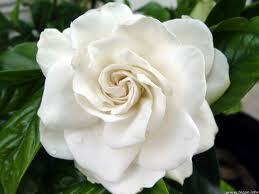 The flower must have been a gardenia, given the overpowering, sweet, sensuous . . . now I would describe it as sensuous . . . scent it gave off. It would have been in water, obviously, and would itself have been cooly aqueous in suggestion. Later I might have described it as having a 'dewey freshness,' the same phrase I apply to attractive guys of a certain sort. My mother, who was enrolling me in kindergarten, politely noted the scent. (Later, at home, she complains about getting overpowered by it.) "This is my favorite flower, gardenia," said Ms. Kaki (at least so I have reconstructed this in my memory), the school director. Ms. Kaki (what she told the students to call her; her actual name was 'Catherine', I think) would come to strike me as like the gardenia . . . a bit overpowering. I would always think of her, with her powerful build and her black hair, whenever my eyes scanned the woman in the cartoon strip B.C. who was always whomping on snakes. The gardenia is Ms. Kaki's flower. Powerful, Heavy, Strong, Rank even. Add to these the qualities that make it the emblem of a woman with her own ambiguities, Coco Chanel: Sensual, overwhelmingly Sweet, Elegant in her hands and the hands of her perfumer. Something to abandon oneself to in a rapture . . . I do so now, though I was surely to young to do so then. My mother hated the white flower. I was caught up by it then, and I love it now.